The publication provides information for commonly asked questions on DON/VOM found in small grains. Additional information is provided on management of DON/VOM. Deoxynivalenol (also known as vomitoxin or VOM) is a mycotoxin produced by the fungus Fusarium graminearum, which causes Fusarium head blight (FHB), or scab, of small grains. DON can cause feed refusal in livestock and vomiting in humans and animals. The U.S. Food and Drug Administration (FDA) has implemented advisory levels to promote a safe food and feed source. Current advisory levels for food products consumed by humans is 1 part per million (ppm); 10 ppm for ruminating beef and feedlot cattle older than 4 months (cannot exceed 50% of diet); 10 ppm for poultry (cannot exceed 50% of diet); 5 ppm for swine (cannot exceed 20% of diet); and 5 ppm for all other animals (cannot exceed 40% of diet). Warm (75 to 85 F), wet and humid weather promote the development of FHB and DON. Small grains can be infected by Fusarium spores from heading until the soft dough stage. 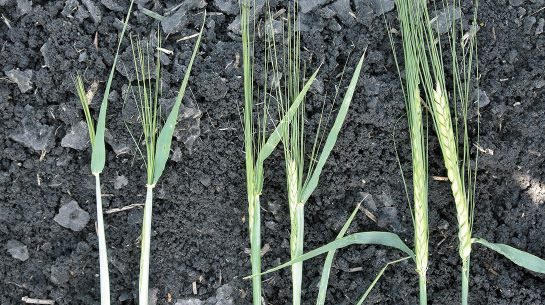 Wheat is most susceptible at early flowering and barley at heading (Figure 1). 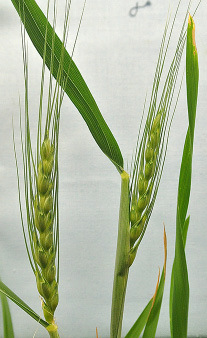 Early infections (early flowering) often will result in bleached spikelets, causing lightweight, chalky and pink kernels. Late-season infections (post-flowering in wheat or post-heading in barley) may result in symptomless kernels, yet the fungus and DON still can be present on the seed. DON levels do not always correlate with the amount of scabby kernels in a sample. Figure 1. 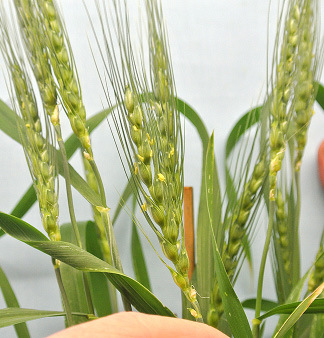 Symptoms of FHB on wheat (above) and barley (right). Laboratory techniques used to measure DON concentration include Enzyme Linked Immunosorbent Assay (ELISA) — often used at elevators — and liquid and gas chromatography methods used at university testing labs. Variation in the testing of DON levels is highly influenced by sampling, so having a representative sample tested is important. A single scabby kernel can have DON levels less than 0.5 ppm or exceed 270 ppm (Figure 2). Therefore, predicting the effect of a scabby kernel in a seed lot is difficult, and removing as many scabby kernels as possible is important. Figure 2. A high amount of scabby kernels in a durum seed lot. Notice white-chalky to pink kernel discolorations. Cleaning can help remove scabby kernels and lower DON levels. However, due to the variability of DON in a grain sample, the effectiveness of each cleaning system (ie: air, gravity table, combo) will have varying results. When deciding to clean a high-DON seed lot, the greatest amount of DON reduction is likely to occur in lots with a high proportion of severely damaged kernels. If a late-season infection occurs, kernels may be symptomless and are difficult to separate from healthy kernels. 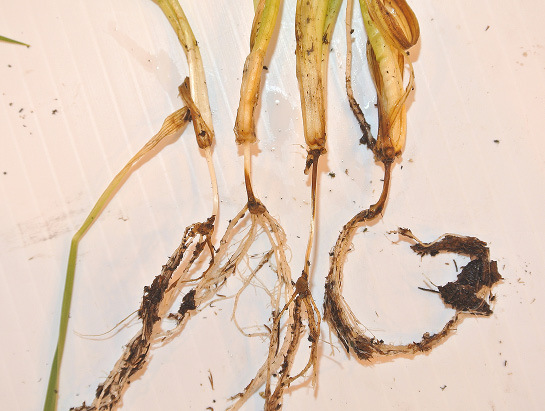 Do not use a high-DON lot for a seed source because Fusarium graminearum also can cause seedling blight and root rot (Figure 3). If you decide to use a high-DON lot for seed, clean the seed rigorously, treat it with a fungicide, check the germination rate and adjust the plant population appropriately. Seed lots with very low germination after cleaning should not planted. Blending of low and high DON grain samples may provide some reduction in DON, but is not guaranteed due to the variability of DON among kernels. A 50/50 blend of a high and low DON sample will not achieve a mid-point value, as seen when blending for protein levels. An integrated strategy that involves resistant varieties, cultural practices (crop rotation, multiple planting dates) and timely fungicides provides the best suppression of FHB and DON. Host resistance is not created equally across small-grain crops. The highest amount of resistance is found in hard red spring wheat followed by barley then durum. Do not use strobilurin (FRAC 11) fungicides for the management of FHB and DON. Triazole (FRAC 3) fungicides provide the most suppression of DON and FHB, and efficacy differences exist among triazole products. The best time to apply a fungicide for DON and FHB suppression is at early flowering for wheat and full head for barley (Figures 4 and 5). Research has shown that applying a fungicide too late is better than applying it too early. Fusarium growth and DON production stop when grain moisture levels fall below 22 percent. Avoid storing seed lots with scabby kernels at high moisture levels, even briefly. 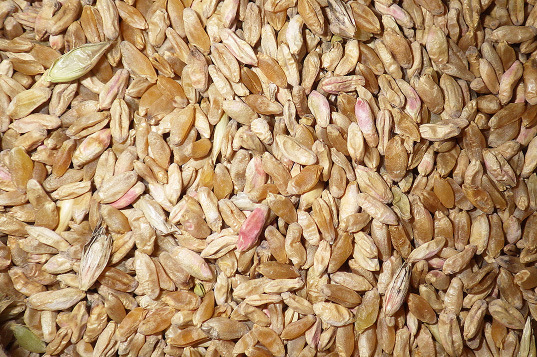 Grain infested with Fusarium that has been cleaned to remove the lighter, scabby kernels will store better than infected grain that has not been cleaned. DON will not degrade or dissipate through time, so do not expect DON levels to change in grain that is stored properly. Published with support from the North Dakota Wheat Commission.